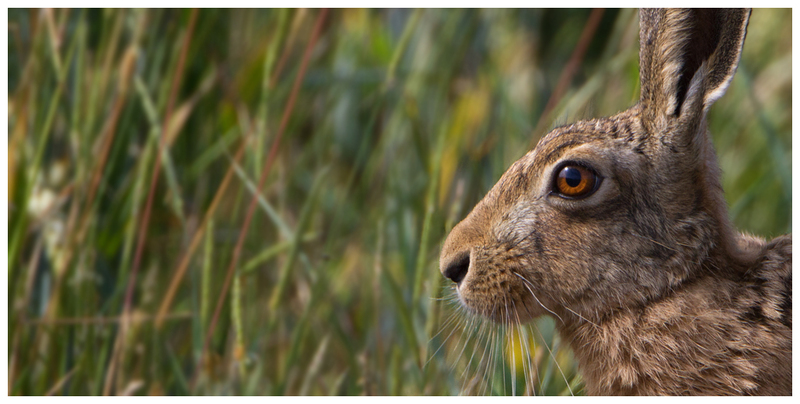 After getting myself out of the doldrums with the flycatcher, I paid a visit to Lincolnshire where I caught up with some brown hares, including a youngster. Definitely the best images I have managed of these creatures to date, and a welcome addition to my galleries. 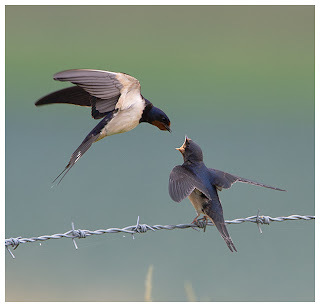 Later that day, whilst checking out the RSPB Freiston Shore reserve, I spotted several juvenile swallows resting on a fence, and being fed by the parents. More success with the camera. Things were on the up. So on to Anglesey. Having only spent a day on the island years ago, before I had gotten into photography properly, it had become one of my most-wanted in terms of places to revisit. When Ann said she'd booked a static caravan for a week, I jumped at the chance to go, and dragged Dad along - he'd never even been there before! The drive up wasn't great, mainly because I'd left it until 9am to start out, and got caught in the run-to-the-sun queues along the north coast of Wales. But once we had unpacked, we headed straight out to look around. 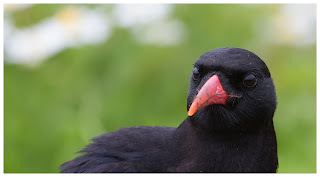 After calling into several places, we found our way to RSPB South Stack, with me hoping for views of choughs, and also for Dad to see a puffin, at long last. And it was Ann who spotted my target beside the road on the way up the hill to the reserve. Feeding in a horse paddock, a pair of choughs were busy digging out grubs from the ground, and gave great views for us as we got the cameras working for the first time on the trip. Up at the car park, we scanned the skies, heather and sea below for interest. Dad broke his duck on seeing a puffin when I spotted a small group bobbing around on the water, but way too distant for a shot. 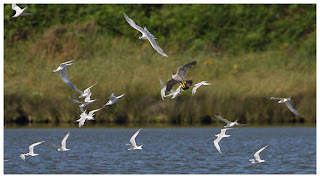 Overhead were various gulls, though their calls were pierced by the wail of a pair of peregrines, no doubt scanning the area for something to catch! 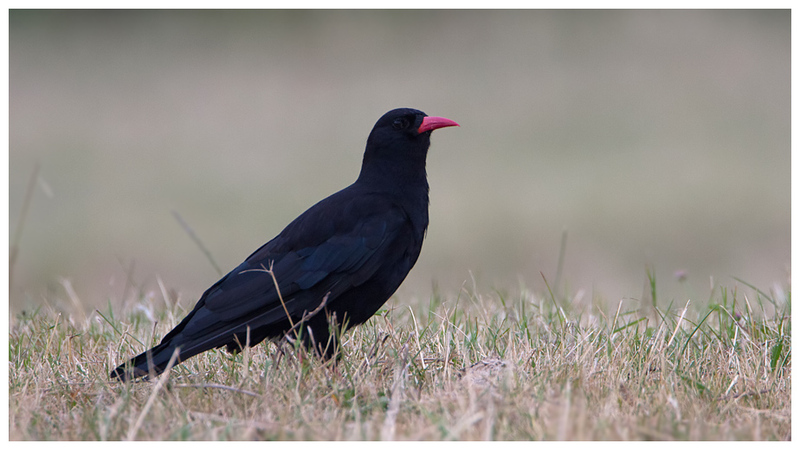 The drive up seemed to catch up on me late afternoon, so we decided to head back to the 'van, stopping for some more chough shots along the way. The first impression of the island was really rather good. Clear skies greeted us the next morning, so another tour was the order of the day, starting with a brief look around the RSPB Valley Wetlands reserve. 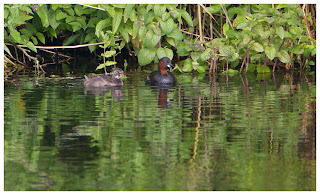 Here the short walk from the car park was accompanied by the sound of sedge warblers, and the pools were busy with wildfowl. 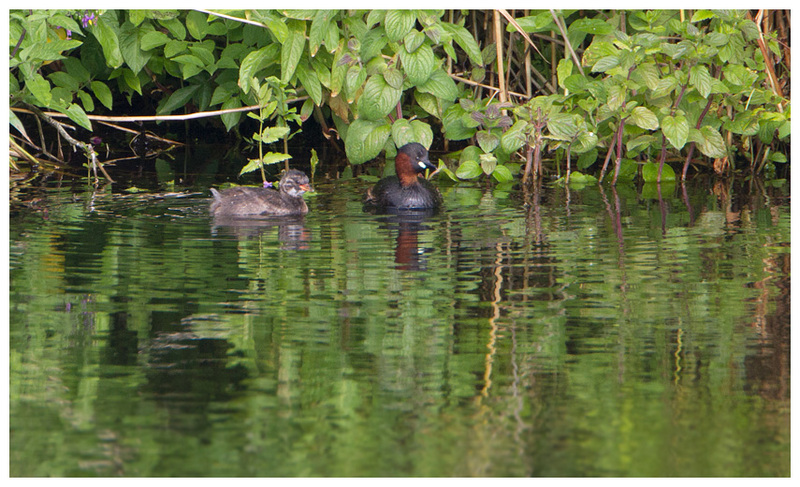 Some little grebes, catching our eyes. 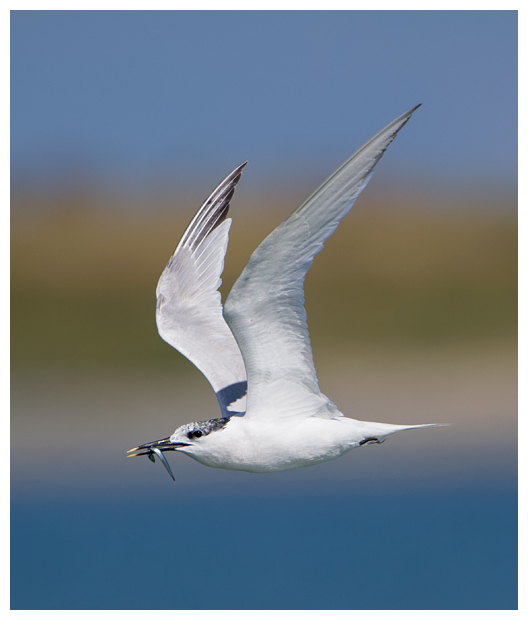 With such lovely weather, I made a beeline to Cemlyn Bay, to see the tern colony. On arrival we encountered a lady who had managed to get her Fiesta stuck in the gravel on the car park, and wasn't going anywhere. With the help of another Skoda-driver who had some rope, I was able to use the Yeti to pull her free, much to her relief, no doubt. Good deed done for the day, we set off across the shingle beach, to set up near the pools behind it, to photo the terns coming and going over us. 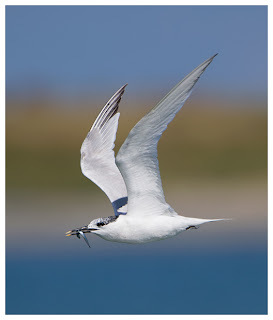 In Shetland I was lucky enough to get shots of Arctic and common terns, so I was mainly after sandwich terns here, and there were plenty around. 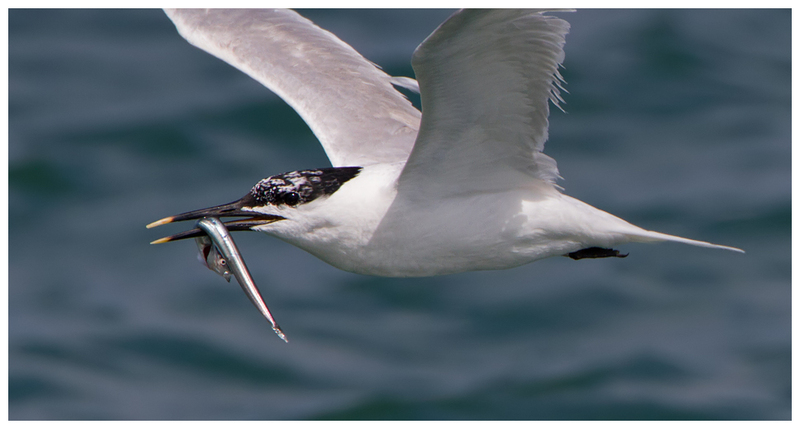 The sea must be packed with fish as they always returned with food for the youngster waiting behing the beach. 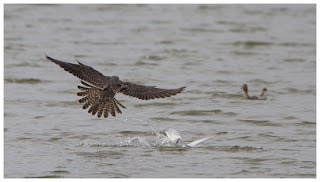 Then came a period of real excitement, as a peregrine dived down from the skies, scattering the terns, and began to chase whatever it could find, for its dinner. 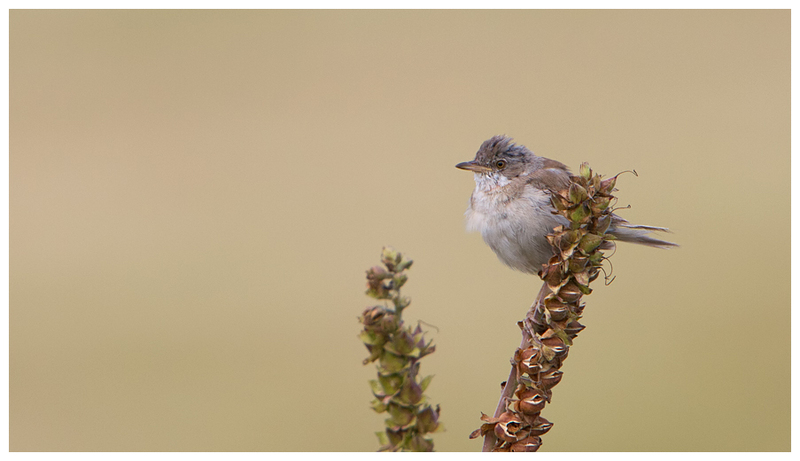 After several minutes though, it gave up and retreated to a nearby hillside for a rest. 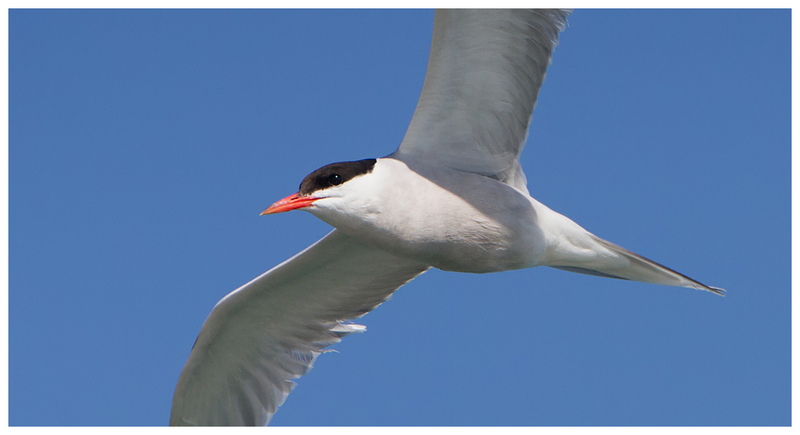 I turned my attention back to the terns, and enjoyed the challenge of following the birds as they came in high and low, from off the sea. 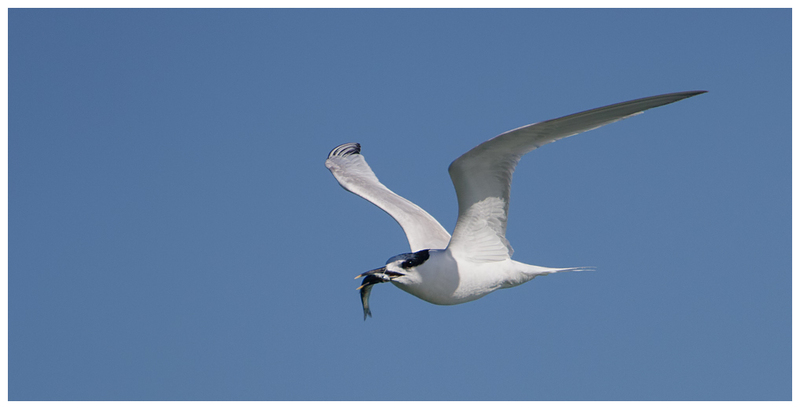 As well as the sandwich terns, there were common and Arctic too. All seemed to be doing well with their fishing. 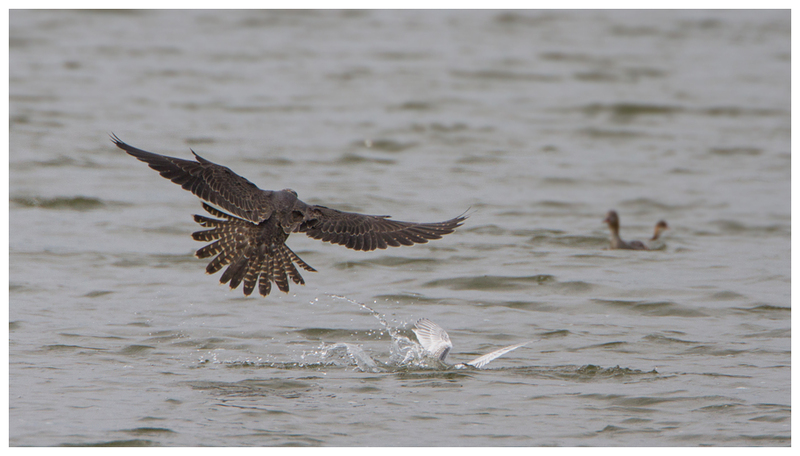 The peregrine returned to action after catching its breath, and almost caught a tern, but lost grip, and the tern dived into the lagoon below. 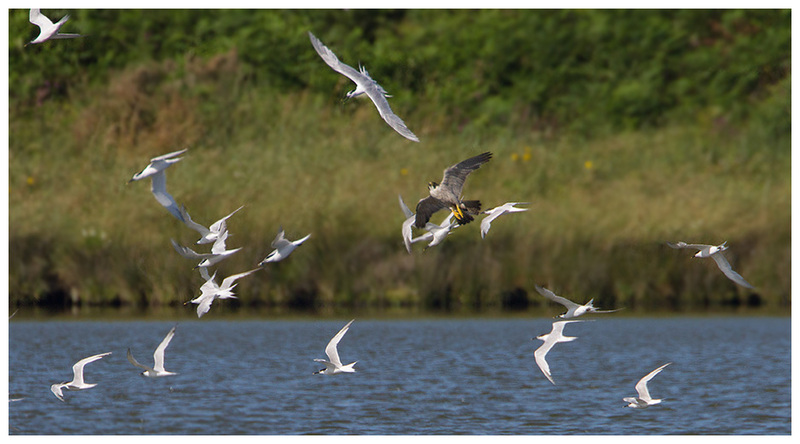 Eventually the peregrine headed out to sea, tried chasing some more terns there, before giving up and flying off towards the power station. We followed, though we headed to Point Lynas instead, and were soon watching a family of kestrels as they hunted over the steep slopes beneath the lighthouse. 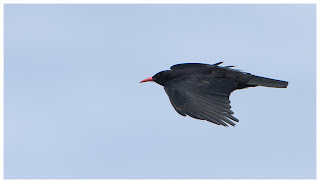 More choughs were feeding in the area too, and their frequent movements from one side of the headland to the other gave us opportunities of catching them in flight. 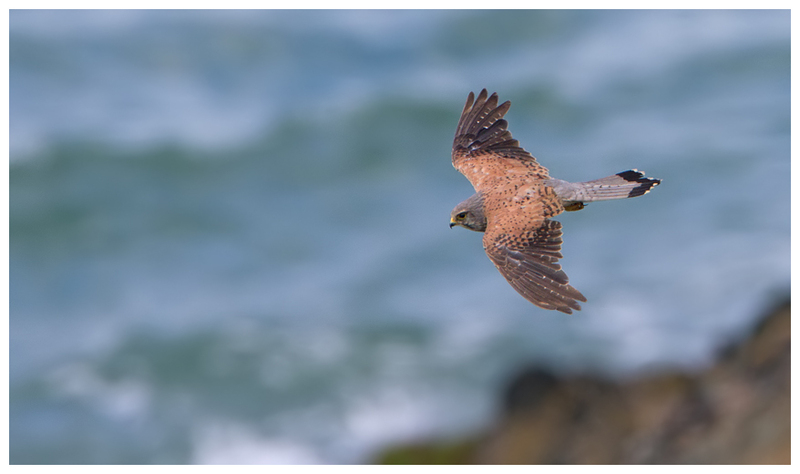 But I kept returning to the kestrels as they were using the sea breeze to hover, and constantly hunting. I would have stayed longer but I could feel the skin on my face tightening - sunburnt already! Wanting to perhaps get a closer view of the seabirds around South Stack, we opted to try again, though this time get there for opening time, and take a look at the island with the lighthouse on it. 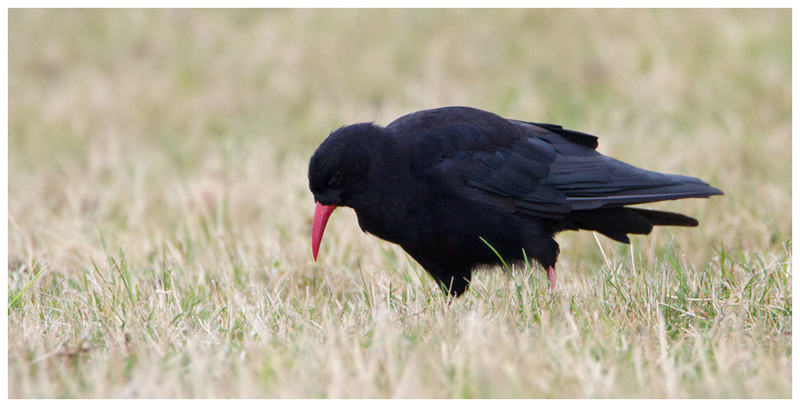 Again we spotted choughs around the fields on the way up to the RSPB car park, and again we took some more shots. 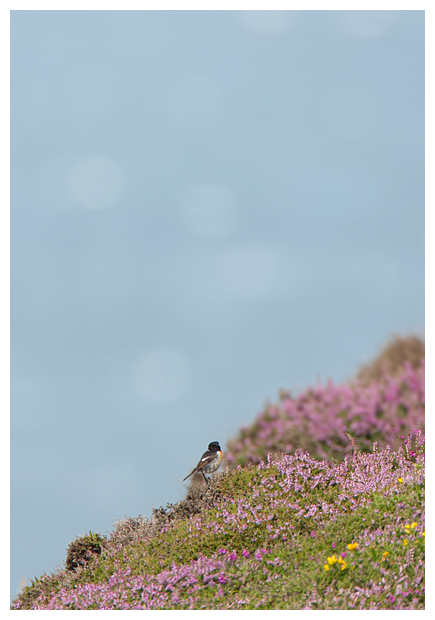 Also around were stonechats, perched up on the vibrantly coloured heather. The problem with reaching the lighthouse is the route down. A few steps. 400 of them, to be precise. It was ok going down, though the steep metal ones just before the bridge over were a bit dangerous with all my gear balanced on my shoulders. 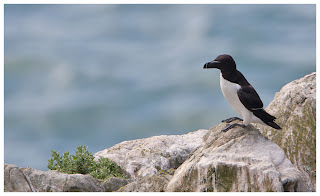 The other problem was after reaching the island, we realised that the place is basically set up for tours of the lighthouse itself, and not for views of the seabird colonies (it's not part of the RSPB reserve). 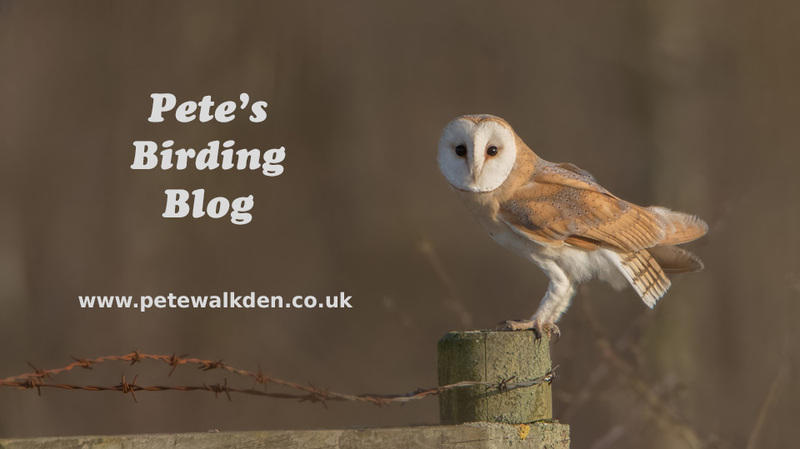 After a while I managed to find some sort of view point by a fence, to look across at the birds, mainly gulls it has to be said. 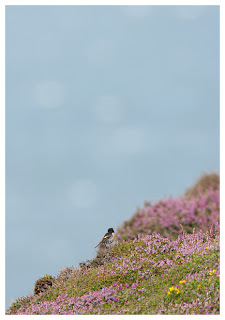 No sign of puffins other than those on the water, and they were obscured from view by the slopes of the island. If I'm honest, I would say that it wasn't worth the walk down, but I still got some shots of what I could see. There were a few razorbills around. 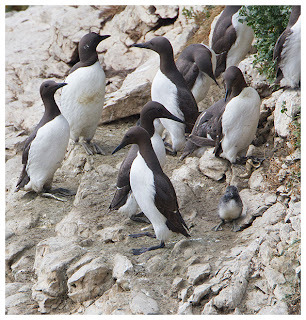 Plus guillemots in greater numbers, with chicks. They are adorable, I must add. 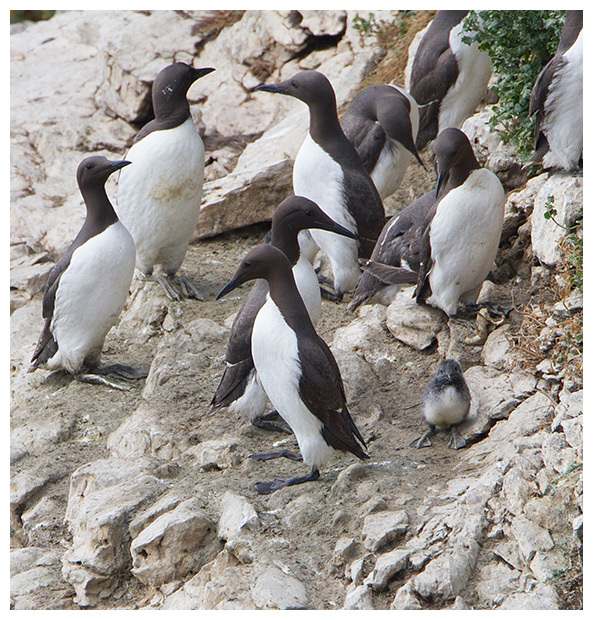 And I spotted some nesting fulmars almost hidden in nucks and crannies in the rock face, the odd kittiwake, and a few oystercatchers, some with chicks too. If the walk down was daunting, the hike back up was grim. My legs were like jelly only about a third of the way up, and I used the excuse of stopping to look at the view several times to recover. We all decided after the trek that we'd not bother visiting the island ever again! More chough pics on the way out, as well as some of the smaller birds on site (linnets, greenfinches and stonechats) and I was in need of a pint. We followed the road around the island and found a pub called The Pilot Boat Inn which served a lovely ale by Robinsons, called Blonde. Was most welcome, and from the beer garden we had a distant view of an estuary. It had to be explored, and after finding the right road down, Dulas Bay stretched out in front of us as we parked up at the Afon Goch estuary. Curlews, godwits, gulls and shelducks were in good numbers, though sadly on the other side of the water, and with the heat haze we had no chance of getting anything worth keeping. 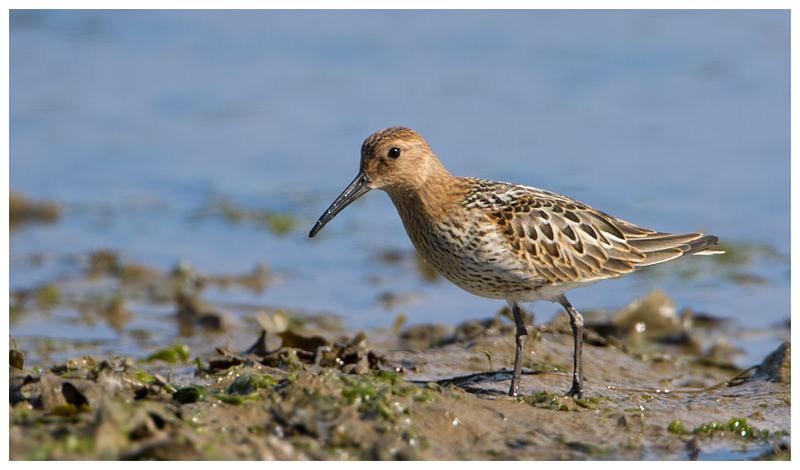 Thankfully a pair of dunlin decided to feed on our side, and a careful approach yielded some decent shots. Being such a lovely spot, we returned several times during the week, and of course popped into the pub each time too! 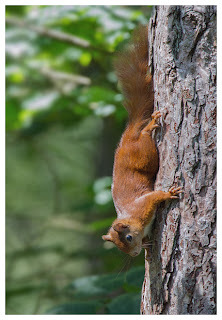 Aside from choughs and terns, I had read before going that the island has been running a programme to eradicate greys in favour of red squirrels, and after a few visits to different woodlands, we spotted them approaching feeders nailed to trees for them. 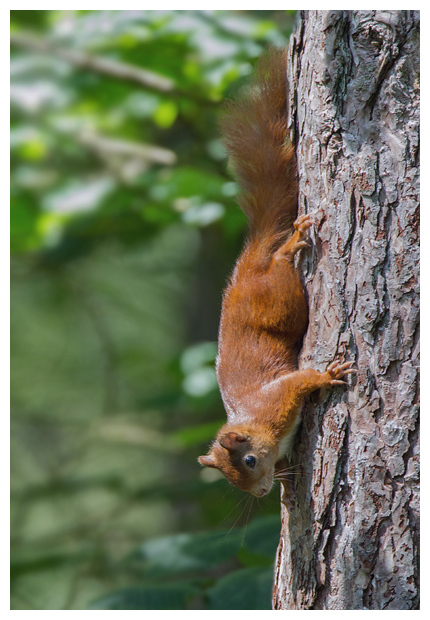 It was rather amusing in that the flip-up top lids of the feeders had been pecked / chewed open, yet the squirrels still tried to lift them up, almost being whacked on the head when it fell back, before going in via the obvious hole! So where else did we visit? 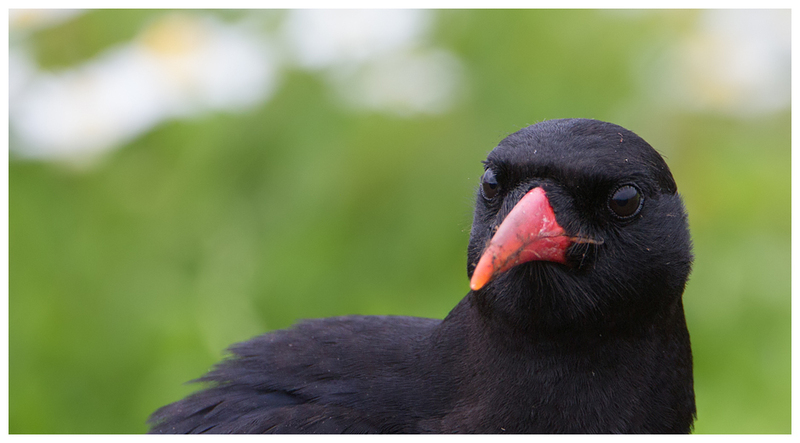 Well, South Stack proved to be a draw on a number of occasions, resulting in yet more chough pics. 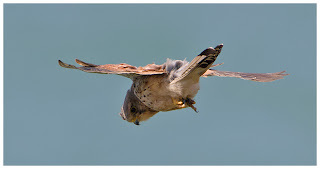 On one occasion, we had two that were oblivious to people nearby, busily digging in dirt to get at the grubs, and were so close I had to remove the TC to get a closer focusing distance. Llyn Alaw proved to be a very calm spot; a huge lake with numerous birds on, though mainly the other end to where we were. Orchids all around, flowers and loads of butterflies and other insects, plus brown hares! And a kingfisher that refused to sit still for Ann to photo. Aberffraw looks to be perfect with its dunes and grasslands for owls and other birds of prey, but not when we were there, alas! 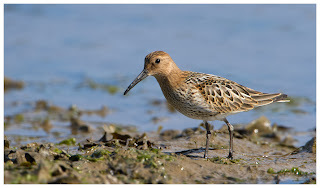 Malltraeth is a good spot for watching waders, with good numbers of little egrets viewable from the bridge and also from the paths leading past the small lakes. Plus the RAF base was worth a viewing, with the jets landing and blasting off noisily, frequently. 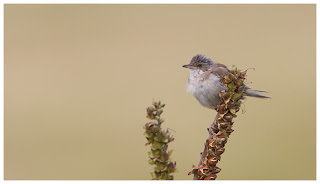 And Cemlyn Bay tempted me back for another go at the terns, taking in views from the other side by the old ruins this time, seeing the seals out on the offshore rocks and a pair of whitethroats near the car park. 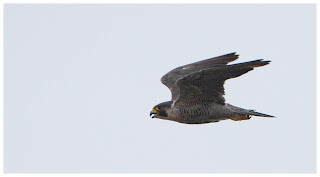 As before, the peregrines provided some additional excitement, with both an adult (successfully taking something) and a juvenile (having less luck) disturbing the colony. Having found a great local pub (Groeslon Hotel) near our digs, we enjoyed superb meals and ale after each day out before heading back to the caravan to hope the TV might decide to work long enough to watch some of the Commonwealth Games. On our last night, Ann decided to order chips and a crumble with custard as her meal, much to the surprise of us all, including the bar staff, but it was probably wise, as the crumble was cool enough to eat by the time she'd polished off the chips! The final morning was wet, so we didn't feel too gutted to leave. The island is about right for a week, at this time of year anyway. Maybe in Winter with some more migrants around it might warrant a longer stay, but for a week in July, in good company, fine weather and decent digs, it had been a good tonic for us all.